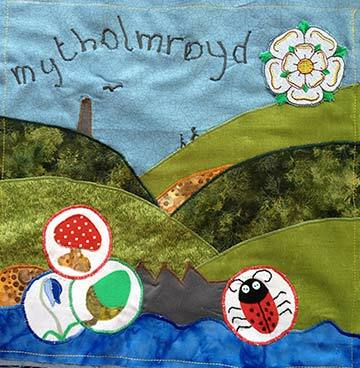 Members of Mytholmroyd walkers' Action have sewn this 30 cm square to be added to a national Walkers are Welcome banner. This banner will comprise 'squares' from many of the 100 or so Walkers are Welcome towns, who will be gathering in Chepstow this October for the annual get-together. Mytholmroyd Walkers' Action are pleased to announce the launch of the Making Tracks in Mytholmroyd booklet that includes six beautiful walks, a quiz and countryside information for young minds. We handed out a share of the booklets at Milly's Cafe on Tuesday 23rd Juyl 2013 (photos). Look out for the booklets in the coming weeks, as we will be providing Mytholmroyd primary schools, playgroups and children's clubs with them to give to children, to encourage them to enjoy and learn about the countryside. 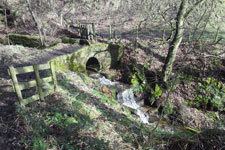 Our Children's Walks page provides full details about the project. Thanks go to Hebden Royd Town Council, the Co-operative Society, Calderdale Council (both its Community Small Grants and Rural Development Grants), Calderdale Council's Countryside Service, its Countryside volunteers, its Rights of Way team, and the artist, Jo Poyser, whose illustrations for children's walks inspired us to carry out this project. You can purchase your own copy of Making Tracks in Mytholmroyd for £1.50 in several local Mytholmroyd shops. Alternatively, you can order and pay for a copy via PayPal by clicking the Buy Now button on the right. The price is £1.50 (including postage). 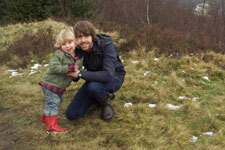 Welcome to the web site of Mytholmroyd Walkers' Action (MWA). We hope you enjoy discovering for yourself the beautiful south Pennines countryside in our area of Yorkshire. We are a community organisation, initially part of Hebden Bridge Walkers' Action, but becoming an independent group in November 2008. We launched our first initiative of three waymarked walks, all setting off from Mytholmroyd station, on September 29th 2007. Encourage more walkers, walking more. Ensure public rights of way and footpaths are kept open. Make walking more attractive to a wider range of residents. Encourage more visitors to make Mytholmroyd a walkers' destination. Encourage more journeys to be undertaken by foot, rather than private car use. Work with other partners/providers to promote walking for a healthy lifestyle. 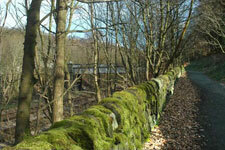 Developed three waymarked walks, all starting from Mytholmroyd station. Erected two information boards illustrating these circular routes. Produced Mytholmroyd: three waymarked walks leaflet for sale at 50p each. Become a Walkers are Welcome town. Developed a Hughes on the Hills walk for the Ted Hughes' festival. Worked with the Elmet Trust, Royd Regeneration, Calderdale Countryside Service, Mytholmroyd Station Partnership, Calder Future, Mytholmroyd Brownies and the Marmaladies. Developed short Walk@Work lunchtime routes from Mytholmroyd's major employment centres. Worked with Calderdale Countryside Service and Calderdale Highways to help maintain and improve public rights of way and footpaths in the Mytholmroyd area. 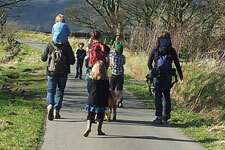 On 23 July 2013 Mytholmroyd Walkers' Action launched the 20 page children's booklet Making Tracks in Mytholmroyd. The booklet includes six beautiful walks with maps and countryside information, as well as a quiz and other activities for young minds. We have provided Mytholmroyd primary schools, playgroups and children's clubs with free copies of the booklet to give to their children, to encourage them to enjoy and learn about the local countryside. 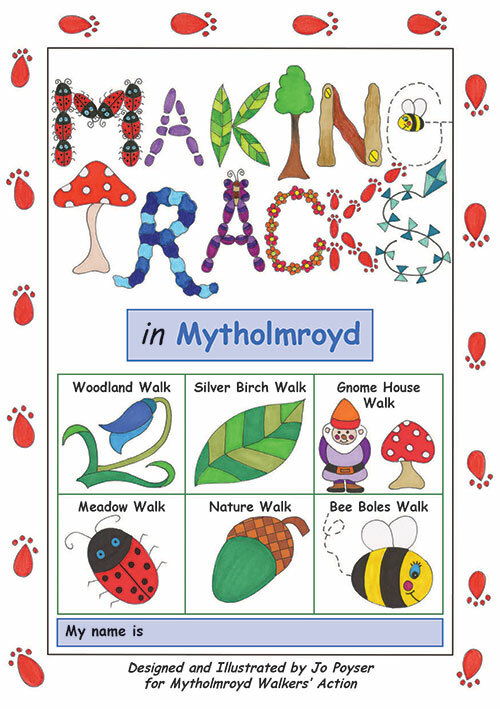 Our Children's Walks page provides full details about the project and how to get your own copy of Making Tracks in Mytholmroyd. Thanks go to Hebden Royd Town Council, the Co-operative Society, Calderdale Council (both its Community Small Grants and Rural Development Grants), Calderdale Council's Countryside Service, its Countryside volunteers, its Rights of Way team, and the artist, Jo Poyser, whose illustrations for children's walks inspired us to start this project. Launched on 7 May 2009, this project recognises Mytholmroyd as a major employment centre with over 2,000 employees based locally in its half dozen industrial and business parks. MWA has been working with local employers, Calderdale Council's Countryside Service and the local Primary Care Trust to develop a range of short walks, setting off from each of the main business parks. Walking for health is a central aim of this initiative, and so all these walks include enough hilly terrain to get you out of breath! You can download the Walk@Work Leaflet for details of the six easy lunchtime walks. 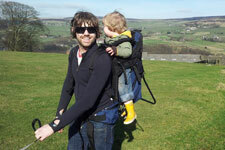 Do try them out - they are a great way to enjoy the Mytholmroyd countryside and get healthier at the same time. A major initiative has been the development of three waymarked routes from Mytholmroyd station. These walks are all circular but vary in length and difficulty. The easiest is to Wood Top, a former weaver's hamlet; the second explores Scout Rock, a well known local landmark; and a longer more difficult walk includes hills and moorland, visiting a famous local standing stone known as Churn Milk Joan. Links to details of these walks are listed on the left. Printed guides to these walks are also available locally (50p each) in shops, cafes and pubs. Large display boards at Mytholmroyd railway station and at St. Michael's church also show clearly the three waymarked walks. 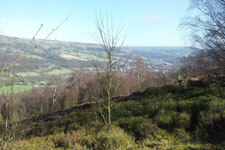 A further free leaflet describes a lovely walk down Cragg Vale, beginning with a bus ride up the valley. Major improvements have been carried out to this riverside path, but waymark signs have yet to be provided. One of the first initiatives of nearby Hebden Bridge Walkers' Action was an accreditation scheme for towns that welcome walkers. Hebden Bridge, with Mytholmroyd, had the accolade of Britain's first Walkers are Welcome town. Mytholmroyd became a Walkers are Welcome town in its own right in September 2007. You will see Walkers are Welcome Here stickers in Mytholmroyd's pubs, cafes and shops. Full details of what's currently going on are posted on our Walking News page. Current Officers: Rose Wheeler (chair), Jean Williams (treasurer), Julian Harber (footpaths). Please email us at info@mytholmroydwalkers.org for more information, or if you want to get involved in Mytholmroyd Walkers' Action. Copyright © 2009-2014 Mytholmroyd Walkers' Action. All Rights Reserved. Available £1 from Hebden Bridge	Visitors' Centre, Mytholmroyd	Post Office and the Blue Teapot. 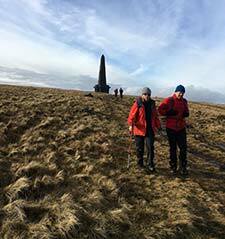 Local residents have often asked about the different ways to approach the iconic peace monument, and now walkers can chose one of four ways to the top, with one easy route back down to Mytholmroyd. West Yorkshire Metro contributed funding for the leaflet, aswell as Hebden Royd Town Council, since short bus rides are involved in some of the walks. Walk one takes a pretty woodland route up through the nature reserve at Broadhead Clough; the second route with a bus trip as far as Cragg Vale junior school, goes from the Hinchliffe pub, past Withens Clough Reservoir, and up onto the moor; Walk three involves a bus trip as far as Blackstone Edge Reservoir (near the White House pub) and follows some of the Pennine Way back to Stoodley Pike. Walk four is the most direct route from Mytholmroyd itself, and it is this route that is suggested for walkers to return to Mytholmroyd. Members of Mytholmroyd walkers' Action have sewn this 30 cm square to be added to a national Walkers are Welcome banner. This banner will comprise 'squares' from many of the 100 or so Walkers are Welcome towns. Mytholmroyd Walkers' Action launched the Making Tracks in Mytholmroyd booklet that includes six beautiful walks, a quiz and countryside information for young minds. We handed out a share of the booklets at Milly's Cafe on Tuesday 23rd Juyl 2013 (photos). These booklets are given free of charge to all primary and nursery age children in Mytholmroyd and Hebden Bridge. The price for others and via this web-site is £1.50. You can purchase your own copy of Making Tracks in Mytholmroyd for £1.50 in several local Mytholmroyd shops or at the Hebden Bridge Visitors' Centre. We were sad to see Rose Wheeler step down from her role as Chair that she held for a number of years, and wish her the best of luck with all her future pursuits. Our current committee comprises Rowena Bairstow (Chair), Jean Williams (Treasurer), Loren Archer (Secretary) and Julian Harber (footpaths). Jean and Julian have been involved for a number of years with the group, and we welcome Loren back as she was an active member a few years ago involved in the evening and children’s walks. If you would like to become involved please contact us through the Facebook group/page/ or email us at info@mytholmroydwalkers.org for more information, or if you want to get involved in Mytholmroyd Walkers' Action.